The weekend has rolled around once more and at last everyone in the family is available to spend time together. Rather than jetting off on an expensive weekend, why not spend time in your home? If you have a beautiful backyard with trees, flower beds and a pool, you can decorate this area with outdoor patio furniture, a patio umbrella, heater, awnings, swings and recliners. You can even add a outdoor kitchen. This way, even if the weekend days are hot, you can still enjoy this area by relaxing under the shade of your awning. You can make preparations in advance so that you can rest over the course of your weekend without having to dread the responsibilities that loom on Monday. Following you will find some activities and tips that can help keep you and your loved ones entertained all weekend long, without having to spend a ton of money. Planning ahead is always best so that you are able to bring your entire family together. You can select a weekend when your kids are not busy and the adults in the home do not have to work overtime. Check to see if your neighbors are available as well so that they can join the festivities too. You can even plan to have one weekend day of festivities in your own home and then go and spend time with a neighbor on the next. Barbecues are a great way to entertain everyone. Plan ahead and purchase the meat, some ingredients for side dishes and desserts and beverages. The people you invite can bring food as well and it always makes people feel like they are contributing. I know my friends always bring over new and interesting side dishes whenever we have a BBQ. If you live in a smaller neighborhood you can throw a block party but make sure you check with your neighborhood association first if you have one. You might need to get special permission to do this, however, because it may be necessary to shut down parts of the street. This will enable everyone from your block to come together and socialize as a group. When you can’t do this, a party in your very own yard will be fun as well. 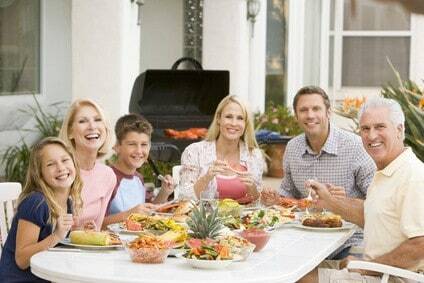 Most of your guests will be happy to simply be together as a group, swimming, barbecuing and relaxing. Take the time to complete all of your chores so that you are not rushing around to dust and vacuum on the day of your big event. Once these have been taken care of you can simply enjoy your time with your loved ones. You can even invite grandparents over so that they can enjoy their grandkids. Making special plans for your Sunday will ensure that you do not get gloomy on the last day of your weekend break. There is a variety of different activities that you can indulge in over your weekend when you have a comfortable patio, outdoor patio furniture, and most of all an outdoor kitchen.We know how people always gather in the kitchen, now they can gather around your outdoor kitchen as well. You can even stay cool in the pool by playing water volleyball and water polo. You simply need to set up a net across the middle of the pool. If your yard is small you can hit the ball against a wall to play a combination of squash and tennis. This is a fun activity for all ages. Another good game to play that is not very costly is miniature golf. Miniature golf turfs can be purchased from a variety of retailers. You can get a turf that has adorable obstacles. For small children who do not like these games you can even set up a special area with perhaps some sand to play in and build sand castles. You can incorporate swings, slides and other entertaining equipment into your kids’ area. Add a backyard pond to your backyard and watch the kids squeal with delight over the fish when you feed them. You can use a patio umbrella to cover a sandpit in order to keep children safe from the harmful rays of the sun. It is easy to see that there is a large number of things that families can do together on a creatively decorated patio. Rather than spending a ton of money for your weekend entertainment, you can instead spend quality time with those you love. As well all know, the best times are spent with family regardless of which activity you choose. Sometimes, just sitting around visiting is the perfect activity.